CBSE Previous Year Question Papers Class 12 Physics PDF 2018 are mildly difficult with certain tricky questions. This is being said by keeping in mind CBSE’s recent trend of setting questions which are not completely straightforward. The questions need to be calmly analyzed by students while reading the paper. 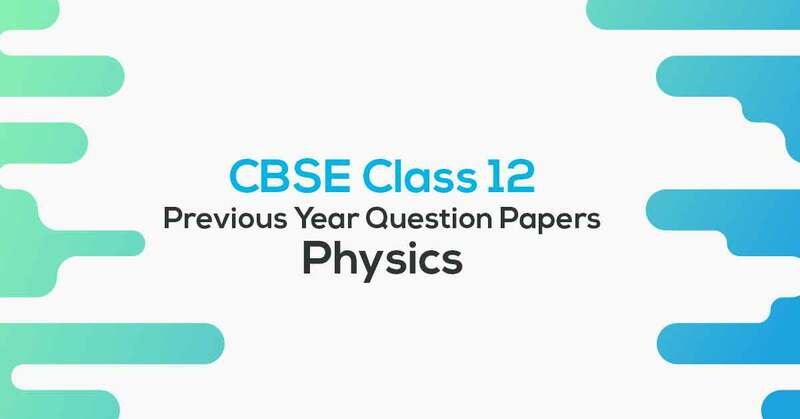 The CBSE Previous Year Question Papers Class 12 Physics PDF 2018 had questions of mixed difficulty levels, with both easy and conceptual questions. According to reports, the Physics paper had quite a few tricky questions, especially in Sections B and E.
Physics papers generally have 15-20 marks worth of difficult and tricky questions, as has been studied by the trends over the years. Overall, the Physics papers allow scoring good marks for very good students, but it isn’t very easy to score for average students. Physics for class 12 is not a very smooth paper for everybody. The papers are also lengthy like the maths papers and Section B is known to sport more and more application based questions over the years. The question paper has five sections: Section A, Section B, Section C, Section D and Section E. Section A contains five questions of one mark each, Section B contains five questions of two marks each, Section C contains twelve questions of three marks each, Section D contains one value based question of four marks, and Section E contains three questions of five marks each. There is no overall choice. However, an internal choice is provided in one question of two marks, one question of three marks and all the three questions of five marks weightage. The students have to attempt only one of the choices in such questions. The physics board exams for class 12 are also expected to be tricky and we have a list of important questions prepared for the same.